日本語要約：6時間、自転車を深さ30cmの雪のなかに押しました。目的地のアヤンジッ ク町へ行くのに、これは別に必要なかったが、アッゴルという観光地にいってみたかったわけです。峠を下れば下るほど雪が浅くなるだろうと思って続けました が、結局変わりませんでした。足が痛くて、重い自転車を押しつづけたが、結局アッゴルにたどり着くことができませんでした。今日山の上で寝て、明日同じ道 で戻ることにしました。Turkey has among the steepest roads that I have encountered on this journey. This morning I cycled one of them. Had I not already cycled almost 7,000km, I would have been pushing. The pass was called Sakiz Pass, and it joins a small town (don’t remember the name) and Ayancik on the Black Sea coast. I inched up the slope at an average speed of 4.6km/h for over 2 hours. I can tell you, it felt good to be at the top. Now, from the top of the pass, the smart thing to do would have been to bomb down the other side, savouring every vertical meter of the 1,250m from the top of the pass to sea level, on a nice sealed road. However, I got just a little sidetracked, which turned a 1 hour descent into a two day struggle.. The road was snowy, but 4WD vehicles had been on it recenty, meaning that I could cycle OK in first gear. That was for about 100m. Once again the road forked. Cycleable 4WD tracks going right, and a sign saying ‘Akgol’ pointing left. The road to Akgol was covered in snow about 30cm deep. If you were walking, you would sink about 15cm with each step. If you were pushing a loaded recumbent bicycle with a small 20 inch wheel at the front, the bike would sink down to the axles in the snow. After 50m of fruitless pushing, I realised that the bike was too heavy. It would sink into the snow, and pushing would become impossible. 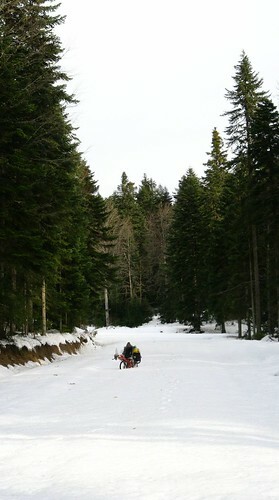 I did however notice that if I removed the front panniers, the bike moved with relative ease throught the snow. 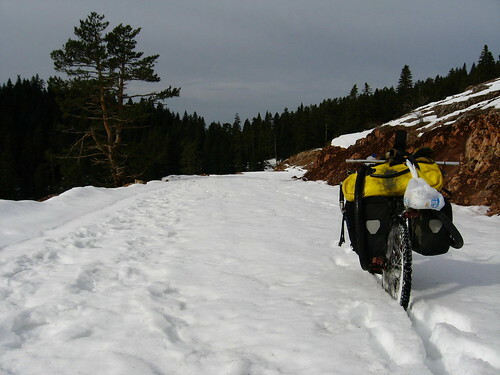 It was painfully slow progress, repeating the ferrying of panniers and bike through the snow. My legs ached, and at times I could only push the bike for two or three meters at a time before needing to rest. I was tired and hungry. The reason I chose to forge on however was because I was going downhill. Surely the snow would thin out as descended, I nievely thought. Problem was that I was in the middle of a pine forest. The road saw very little sun during the day, so the snow had very little chance of melting. Also, according to my map, if I could make it to Akgol, there was a sealed road leading from Akgol straight to Ayancik. From there it would be pain sailing, I thought. By 4:30pm, I had come to another fork in the road, with signs pointing to ‘Akgol’. The mystery tourist spot. ‘Akgol’ to the left, some small villages indicated by a sign pointing to the right. No mention of Ayancik Town. It was here that I began to doubt the accuracy of my map. Perhaps the road forking to the right does actually go to Ayancik, and the road to Akgol is just a dead end, I thought. About 100m down, I could see a lake, surrounded only by large hils. 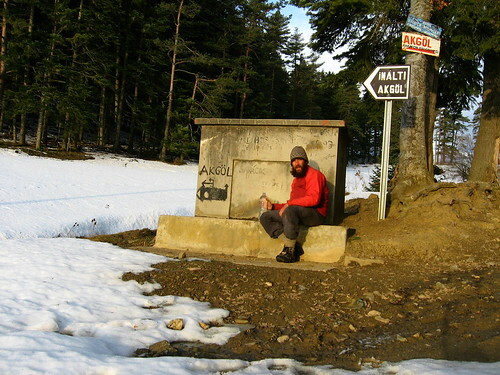 If I go down to the lake, would I have to push my bike up through the snow over a pass to get to Ayancik? Would the snow really thin out? I looked up ‘gol’ in my Turkish-Japanese phrase book, and sure enough, gol means lake. That lake down there, surrounded in snow, is my mystery tourist spot. By now however I had had enough. I was sick of snow. Once I get off this mountain, I thought, I don’t ever want to see snow again. There were powerlines coming from three directions, and converging closeby. One set of powerlines went off to a small settlement on a distant hill, another down to Akgol, and another set coming from the north - the direction of Ayancik. 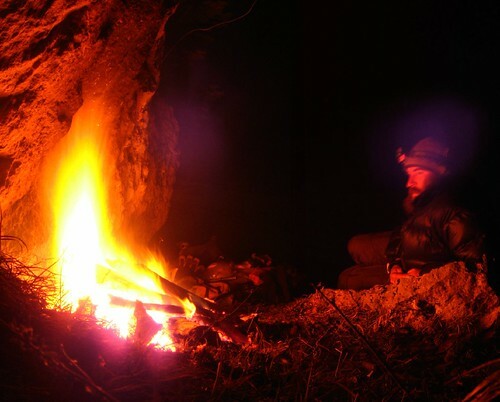 It was too late in the day to turn back, so I decided to camp for the night near the fork in the road. Tomorrow I would go up the right hand road for a while to see where it would lead me. If not to Ayancik, then I would have to resort to the most unappealing option of pushing my bike back up the way I had come.